YO EXL is as smart as it looks. Unlike the conventional vehicles, it runs by electric power and not by fossil fuels. As it doesn’t require any fuel, it doesn’t produce the pollution and keeps the environment safe. YO EXL comes with some special features viz. Apart from this, YO EXL is an electric bike that consists of a high power VRLA deep discharge battery and an efficient motor. The vehicle weight with batteries is 138 Kgs. 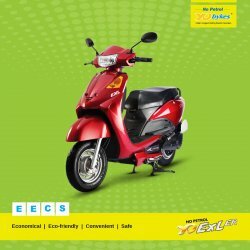 Maximum speed of YO EXL is 55 Km/Hr and in one full charge, it can go up to 60 km.